Trump intel officials: Russia's a threat. Trump: Russia's a hoax. The White House brought out Trump's intelligence officials to give a briefing on the threat Russian meddling still holds for the U.S. on the same day Trump held a rally again calling Russia a "hoax." Carol Leonnig, Philip Rucker, Matt Apuzzo, & Jeremy Bash join to discuss. Rachel Maddow shares a report by Rolling Stone magazine of a persistent and successful cyber attack on Dr. Hans Keirstead, a Democratic challenger to Russia-friendly Rep. Dana Rohrabacher. 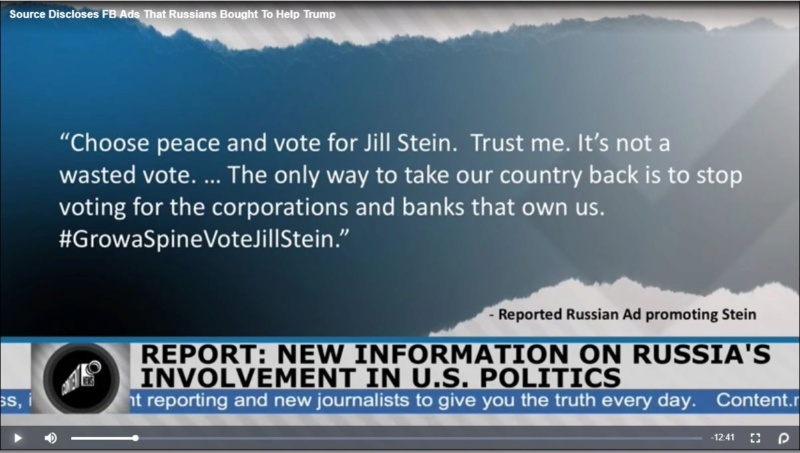 Here was a $150k dollar micro targeted ad buy to pull votes away from Hillary by Putin, enough to pull 1% of the vote away from clinton. this a great segment, a former US prosecutor and, Bushes former Whitehouse ethics lawyer. This lawyer says if anyone in the Bush campaign or RNC would have mentioned a meeting with Russians he would have stopped it before it happened and called the FBI. Rudy Giuliani defended Donald Trump on Sunday, saying ‘truth isn’t truth’ on Meet the Press. Rev. Al Sharpton, in for Joy Reid, discusses the president’s lawyer denying that objective reality exists with his panel. Tony Romm, technology policy reporter for The Washington Post, talks with Rachel Maddow about the breadth of Russia's Internet Research Agency's propaganda effort against the U.S. that extended past 2016 election support for Donald Trump to target Russian sanctions and Robert Mueller. Rachel Maddow reports on a pair of reports released by the Senate Intelligence Committee outlining the Russian disinformation campaign to help Donald Trump win the 2016 election, and notes the continued Russian propaganda activity through 2017 when Russia was trying to get sanctions lifted. wow wow, read these 5 investigations the dems are going after in the house. all items the treasonous former controlled house would not investigate. In fact the right wing treasonous house would not allow dems to investigate. and in the state of the union trump says dems they cannot investigate him. Like Nixon did too. read this list it is very encoumpassing... the day after trump demands no more investigation. as I mentioned he demanded to his people with the power of the presidency to continue investigating Hillary after elected. and again where was he during Clinton, where was he on his investigating Obama and Obamas birth certificate, or Jimmy Carters peanut farm investigation. Or the what 6 Hillary investigations where she even testified a record setting amount of time under oath. or that he and his kids were using a private trump server when in power. and as noted what 40 or so indictments and or convictions of trumps top connections campaign people and so on. Natasha Korecki, national correspondent for Politico, talks with Rachel Maddow about research showing coordinated social media manipulation targeting specific 2020 Democratic candidates. see what happens even if their is right-wing voter suppression. If we just stop the russians dems pound right wingers. WASHINGTON (Reuters) - The U.S. military disrupted the internet access of a Russian troll farm accused of trying to influence American voters on Nov. 6, 2018, the day of the congressional elections, The Washington Post reported on Tuesday. The Pentagon's cyber warfare unit, which works closely with the National Security Agency, had no comment on the report. Cyber Command's offensive operations are highly classified and rarely made public. The Internet Research Agency was one of three entities and 13 Russian individuals indicted by Special Counsel Robert Mueller’s office in February 2018 in an alleged criminal and espionage conspiracy to tamper in the U.S. presidential race in a bid to boost Trump and disadvantage his Democratic opponent Hillary Clinton.